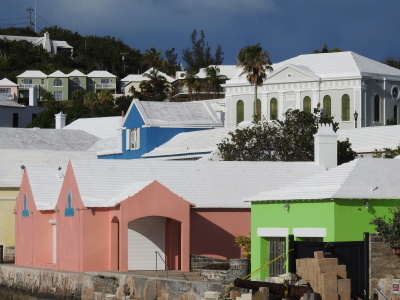 The Historic Town of St George and Related Fortifications, Bermuda is the earliest example of an English colonial town. It consists of the Town of St George and fortifications on small islands commanding access to the Town and the harbour. Permanent settlement here began in 1612. The forts are also of high value as authentic examples of the first defensive works built by these early European colonists. The nominated area consists of the Town of St George on St. George Island: including its original street plan, simple houses, impressive mansions such as Bridge House, the Hunter Building, or Whitehall; warehouses (Long House); several churches including the oldest Anglican church in continuous use in the western hemisphere. St. George is known as the oldest continuously inhabited English settlement in the New World, and it is to the English-speaking Americas what Santo Domingo is to the Spanish-speaking part - the site of many "first" and "oldest" superlatives. E.g., St. Peter's Church is the oldest Anglican and Protestant Church in the Western Hemisphere. 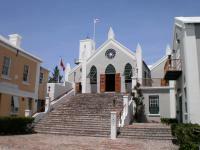 The State House dates from 1620 and is the oldest building on the islands. The capital was moved to Hamilton in the early 19th century, and today St. George is very quiet and looks a bit like an open-air museum for tourists. It is very well preserved and does a lot to highlight its WH status. Included in the site are several fortifications, some of which are just a short walk from the town and can be visited. The best of these is Fort St. Catherine, which houses a very interesting museum. I also went to nearby Alexandra Battery and Gates Fort, both of which can be visited easily in a pleasant walk from St. George. There is also a fine museum on Bermudian history in the Royal Naval Dockyard on the other end of the island, but this is not part of the WHS. Bermuda is mostly visited by Americans and Canadians, and there is only one flight connection to Europe (British Airways to London). I went there for a short stopover of 3 days after a trip to the US, which was very pleasant and convenient. Otherwise, it could easily be visited on one of the many cruise ships that stop there. For an Atlantic island, Bermuda feels much more like the Caribbean, and the related fortifications reflect as much. This small yet lovely island is usually crawling with tourists, but that's no problem. There always seems to be some corner with the solitude and charm that Bermuda exudes. The Town of St. George is very quaint and the townspeople are very welcoming. The place is filled with old world English charm with its cobblestone streets and old buildings. The related fortifications entail the forts that surround St. George. Some of them are not accessible to the public, but my husband and I managed to visit Fort St. Catherine, Fort George, Alexandra Battery and Gate's Fort. These places are walking distance from the town. We visited Bermuda for four nights, which was enough time for me. December 2006 was when we were there and it was not very busy with tourists. Personally, I quite liked it this way and I still enjoyed pleasant weather! Queen Victoria: "Fort Victoria" is listed on the UNESCO Web site as location 983-017 (out of 24) despite this comment in the AB review "the integrity of Fort Victoria has been compromised by its conversion to a hotel recreation facility so that it no longer retains the authenticity necessary for inclusion on the World Heritage List"